Ahh, finally! An episode I can confidently say is good! Apart from a few issues here and there, I would say this episode was pretty cool. 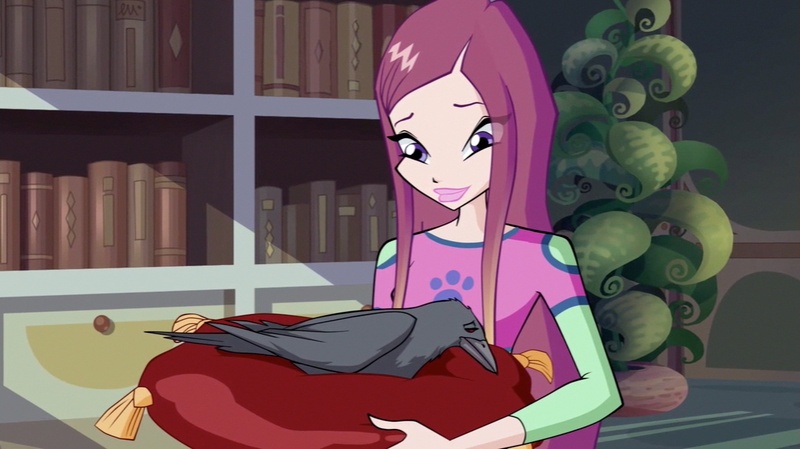 The episode kicks off with Mrs Faragonda putting Griffin the crow under Roxy’s care. The Specialists are then shown training with the Paladins on Lymphaea College. Sky goes up against his cousin, Thoren whilst displaying an annoying amount of angst. 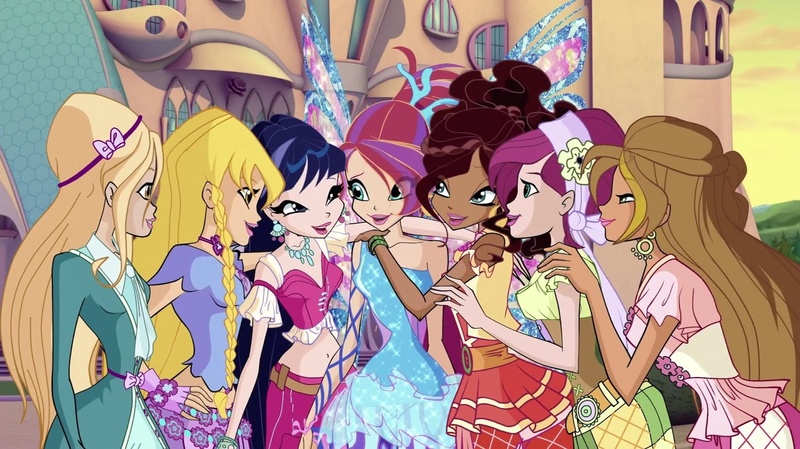 The Winx are in their dorms comforting the pixies. Timmy gives Techna a call and invites her to see them in training. After getting a makeover from Techna, the Winx head over to Lymphaea. When they arrive, Flora goes off to see Miele and the Winx go to the arena were the guys are fighting. Sky beats Thoren with ease and Roy challenges Nex to a duel after he blatantly flirts with Aisha, only to be sent flying over the arena. Aisha saves him and gives Nex a piece of her mind. Flora has a reunion with Miele and has a mother to daughter talk with her about their powers. Roxy reports back to Faragonda and the two work out that the crow is Griffin and that Cloud Tower has been taken by the Winx. At that point,Cloud Tower shows up at Lymphaea and Selina unleashes the Treants on them. The girls…and Miele transform whilst the Specialists and Paladins team up to try and beat them. Bloom deduces that Cloud Tower is the cause of the madness and flies up there with her teammates, blasting freshmen out of the way. They reach Selina and try to attack her but their plan backfires when the Legendarium deposits them out of Cloud Tower. The Specialists rescue the Winx and retreat as the girls are too exhausted to fight and 5 of them have lost their powers. They return to Alphea and tell Faragonda their predicament. 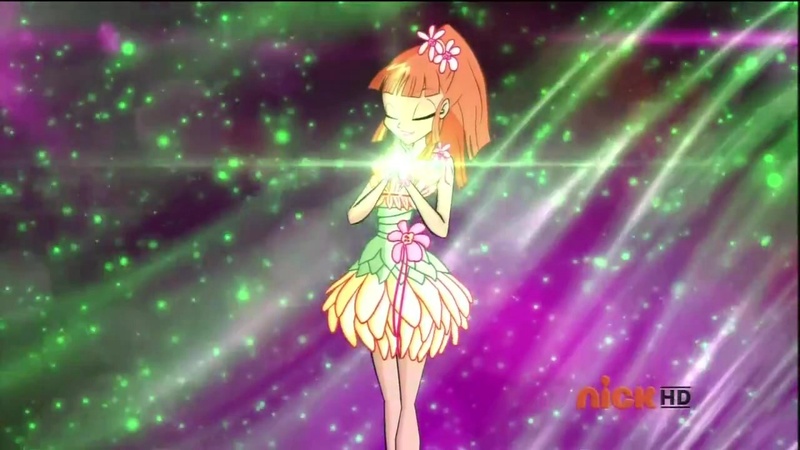 Bloom decides there and then to split her powers into sixes and gives the others five, as she didn’t lose her powers. Faragonda tells them that they will get their new transformation by doing a good deed. This new transformation is called Bloomix. Let’s get all the repeated praise out of the way, shall we? The animation is still keeping its high quality and the voice acting was above average. Thoren has the best voice so far out of all the guys, though Nex gets the gold for best character design. He’s very good-looking and is such a badass with his sword/scythe…thingy. The dialogue was cheesier than episode 2’s but there were lots of stand-out lines spoken by several of the characters. Apart from unnecessary grunts and noises made by most of the cast, the voice acting was good. I also love the new dresses Stella designed for the girls. It looked really pretty and gypsy like, managing to look elegant yet wild at the same time, especially Aisha’s and Musa’s. Despite their uniform flop, they looked effortlessly gorgeous. I also like the Specialists new outfits. They look cool. But, this episode had lots of problems that needed to be addressed. This is something called ‘plot convenience’. It happened in episode 2 and it happened here. It seemed as though the writers were trying to worm their way out of making the character have to explain things to another character by making the character who’s supposed to be in the dark conveniently ‘know’ stuff. Bloom suddenly knew who Thoren was despite having never met him before, Miele knew what Cloud Tower looked like even though she’d never seen it before and the Winx conveniently knew they had lost their powers despite only de-transforming. Doing things like that give the viewer a sense of laziness and sloppiness, and trust me, there’s been a lot of lazy and sloppy writing in Winx recently. The action felt slow and minimal on the Winx’s side as the majority of the fighting was done by the Specialists and Paladins. Naming the transformation Bloomix was completely unnecessary, though I thought it was a good idea for Bloom to give her friends some of her powers. I mean all this while, we’ve always heard how the Dragon Flame is the source of magic but it was never really used as a source of magic until now. But I understand why it pisses several people off. Miele’s sudden jump in age was confusing, but I’m not going to lose any sleep over it. Overall, an impressive episode with lots of things to like about it. It seems as though season 6 won’t be so bad after all.